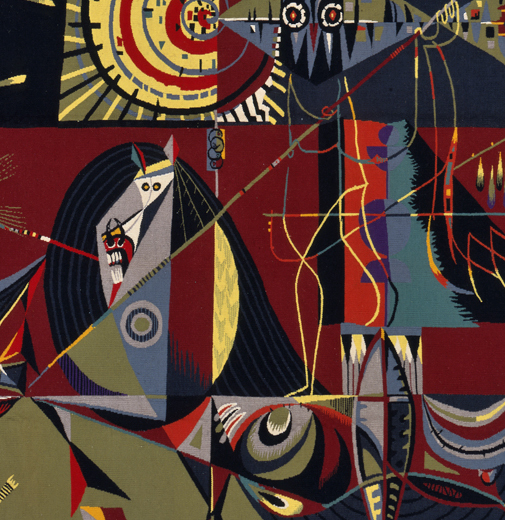 The 20th century was a time of rebirth for the art of tapestry where artists such as Jean Lurcat, Sonia Delaunay, Alexander Calder, Pablo Picasso, Ferdinand Léger and others developed their own cartoons to be made into tapestries. Fashioned after the skills and beauty of antique tapestries, but closely focused on the collaboration between designer and weaver, modern tapestries reflect their time and feature vibrant, bold, imaginative compositions meant to embrace their modern surroundings. Vojtech Blau Inc. is proud to present a selection of its collection of modern masterpieces.